Pound cake is a favorite in our family. It’s the ideal cake- rich and dense with buttery vanilla flavor that needs no icing and requires minimal effort. Normally a basic pound cake is all that we make (although we occasionally stir in some chocolate chips) but every now and then it’s fun to make something extra special. In this case, special comes in the form of extra calories from cream cheese and a strawberry swirl which put the cake over the top! 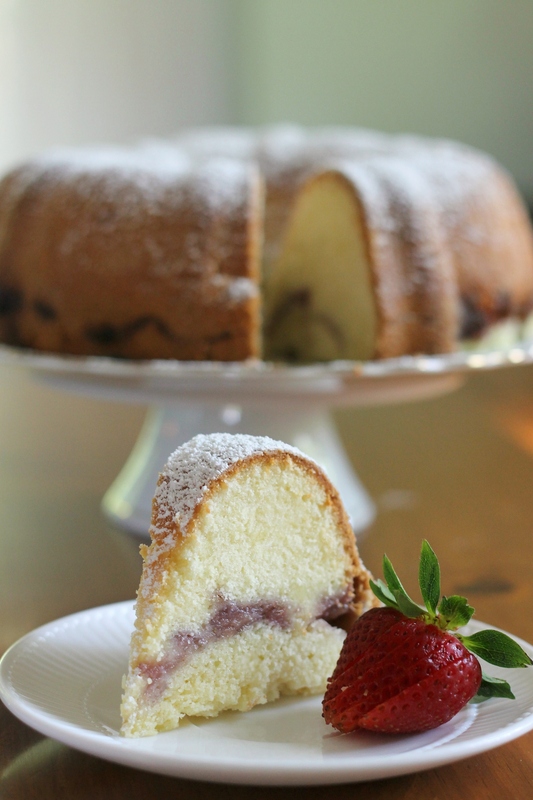 We’d never made a cream cheese pound cake before, and it will be hard to turn back to the regular kind. Cream cheese adds a depth of flavor and a super moist texture. The strawberry swirl is just perfect. We decided to up the berries from the original recipe so that there would be no missing the flavor! Also, we wanted some fresh berry flavor instead of just cooked. These would make nice cupcakes, too- put a spoonful of batter in each liner, a spoonful of the strawberry filling, and another spoonful of batter. This cake is perfect in pretty much every way, and we are convinced that anyone would like it! P.S. The strawberry swirl was definitely redder/pinker in real life, and less purple. We had some weird lighting going on since it was cloudy outside, and we only shoot in natural light. Also, compared to the fresh berry in the picture, of course the swirl looks more purple! Combine the 2/3 cup strawberries, sugar, water and cornstarch in a small pan and cook over low heat, stirring constantly, until the mixture becomes thick. Stir in 1/3 cup strawberries. Set aside and allow to cool before using (you can make the batter as the strawberry swirl cools). Preheat oven to 325 degrees F. Grease and flour a Bundt pan (we used a standard pan and the batter overflowed a bit- luckily we had a cookie sheet in the oven. Use a larger pan, or make a 1-2 cupcakes out of some of the batter). Using an electric mixer, beat the cream cheese and butter on medium speed until combined and soft, about 2 minutes. Add the sugar continue to beat on medium speed, scraping the bowl a couple times with a spatula, until the mixture is light and fluffy, about 5 minutes. Add the eggs one at a time, beating until each one is completely mixed in. Scrape down the sides of the bowl, reduce the speed to low, and gradually add the flour until it has all been combined. Add the vanilla extract and salt and mix on low speed until combined, about 1 minute. Spoon about 2/3 of the cake batter into the prepared pan. Top evenly with the strawberry filling, leaving a 1-inch border around the edge of the pan. 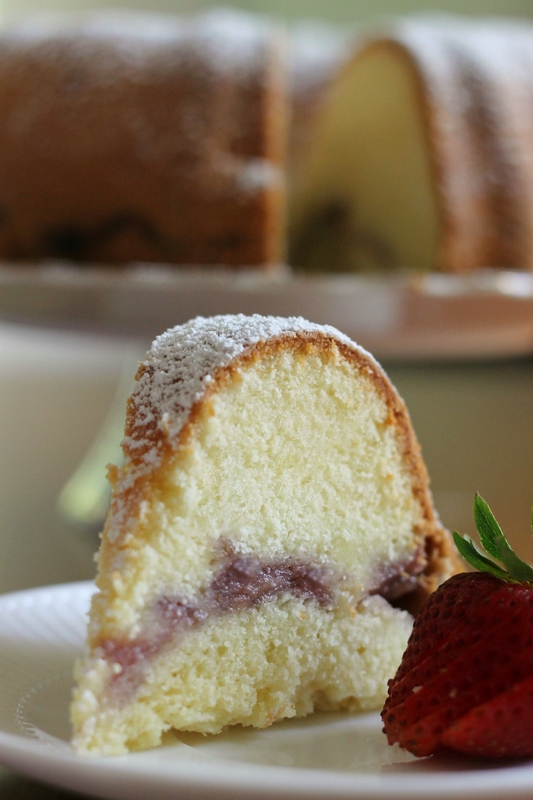 Use a small knife to gently swirl the strawberry filling with the cake batter several times. Spoon the remainder of the cake batter on top of the filling and gently spread to the edges of the pan, covering the filling. Bake for 75 to 90 minutes, or until a thin knife inserted into the center of the cake comes out clean. Allow the cake to cool in the pan for 15 minutes, then turn it out onto a wire cooling rack and allow to cool completely before serving. Serve with a sprinkling of powdered sugar, slice, and enjoy! Store the cake in the fridge if sitting out for more than a couple days.